A Meritage blend sourced from top parcels in the best vineyards, drawing inspiration from the synthesis of art and winemaking. Smooth and supple, this five-grape Bordeaux-style blend is almost two thirds Canoe Ridge estate fruit from the Horse Heaven Hills AVA, the rest Cold Creek Vineyard Merlot. Lovely aromas of sandalwood, spice and cocoa lead into a textural wine, with seamless fruit and barrel flavors. Focused, juicy and distinctive for its rhubarb-inflected red berry and hibiscus flavors, lingering easily on a medium frame against refined tannins. Cabernet Sauvignon, Merlot, Cabernet Franc, Malbec and Petit Verdot. Drink now through 2016. 2,100 cases made. 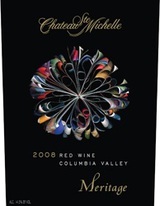 The 2008 Meritage Artist Series is a blend of 51% Cabernet Sauvignon, 36% Merlot, and small amounts of Cabernet Franc, Malbec, and Petit Verdot. The wine was aged for 20 months in 85% new French oak. Notes of Asian spices, cedar, leather, earthy minerals, violets, and assorted black fruits inform the nose of an elegant, relatively forward, incipiently complex, nicely proportioned wine that offers a drinking window extending from 2012 to 2023.